Reality, Reality, Jackie Kay’s latest collection of short-stories, explores the thin line that separates art and the supposed real world. In these fifteen stories, fourteen of which are written in an intimate first-person voice, Kay brings the reader on a journey with the lonely and dispossessed, as they try and comprehend their own perceived reality. In ‘Mini Me’, we follow—in a phonetic Scottish dialect—Patricia, a middle-aged woman who battles with her weekly dietary schedule; In ‘Hadassah’, Kay retells the biblical story of Esther in a modern setting, through the broken English of a prostitute who is being held against her will; and in ‘These are not my clothes’, the reader enters into the consciousness of Margaret, an elderly lady spending her final days in a nursing home, dreaming of her youth. 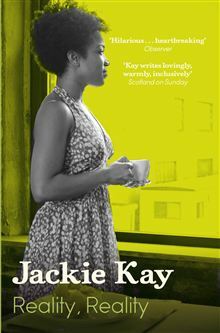 Jackie Kay published her first collection of poetry, The Adoption Papers, in 1991. In total she has published eight books of poetry, three short-story collections, a memoir, and two novels—one written for children. Kay talked to JP O’Malley about what makes a good love poem, why she enjoys alternating between various forms of writing, and why she doesn’t like the term ‘confessional poetry’. Well for many reasons. When you are adopted, like I was, you have another self, and you come with another story. I think I initially became a writer to understand that. I already had this kind of alter-ego, and I think alter-egos and doppelgangers are good food for a writer. I would describe my childhood as a very happy one. However, as a black child, growing up in a very white environment, I was also the victim of racist bullying, one of the ways I dealt with that was through writing. So writing was cathartic for you? Yes, but I don’t think you can just put anything onto the page. What is interesting is creating a form, and working with it, and through that you make sense of chaos. That’s the challenge for me as a writer, confronting emotional and difficult things that have happened to you, and turning them into a sonnet, a memoir or a monologue. Your last collection of stories has many lonely characters. Is this a trait specific to the form of the short-story? I definitely think the short story traditionally is concerned with outsiders who have slightly bleak lives, people who are caught in a moment of time on their own. As a form it does seem to suit the solitary voice. Regret and nostalgia seems to be a very prevalent theme in Reality, reality. Is this something you can relate to yourself? When you get to fifty, you are kind of looking forwards and backwards simultaneously, you seem to have this built in mechanism for nostalgia. The book is definitely exploring old age as a kind of inquiry. Do you find the poem and the short-story share similar qualities? The short-story is the hybrid form: it’s a cross between the novel and the poem. It shares poetry’s love of metaphor and the image, with the novel’s love of the camera wide-angle-lens. It exists half way in-between, and that’s why I love it. I find it a very exciting form to write in, because you can be poetic and sparse in your language, in the way that poems work, where every word has to count. Poems are more temperamental. With a story you can have an idea, and then set to work. The majority of these stories have a very strong voice, how important is that for you in a short-story? A short-story is all about voice: a character’s accent, but also the internal voice. It’s trying to find a merger between the external and internal voice, so that stream of consciousness can happen. The joy in creating a character is in trying to capture their inner voice: the way they berate or escape from themselves. It’s in that area that you get a complexity of a character, a sense of their secret inner life. I listen to the way they talk, and if anything sounds false, it has to go. It’s just a matter of hearing the voice out loud. Is your writing more honest now than it was when you first started out? Yes, I don’t have the same anxiety about creating gay characters now. There are obviously still prejudices against gay people, but it’s not in the same way as it used to be. So now, it feels like my gay characters can be like other characters, and I really like that—it’s what I am striving for, that they live an ordinary life. Whereas in the 80s, or 90s, I had to have them talking about being gay. Now I can be that little bit more sophisticated or complex with how the character is. What do you think is the secret to writing a good love poem? Well first of all it needs to be true. Secondly, it’s the tiny details that make a poem, but it’s also in the escaping of the details, and that might seem like a contradiction. There is also a sense of myth combined with truth: a slide from the truth, as well as running towards it. It might just take a tiny moment: one evening, one meal, or a walk through a wood. I think the poem needs to tighten its focus and its gaze, but also fly away and open its arms. Would you describe your poetry as confessional? I don’t really like the term ‘confessional poetry’. It feels very old now, like a term critics used about women’s poetry, for people like Sylvia Plath and Anne Sexton, back in the 1960s. I mean what is it you would be confessing to: falling in love, or having an open heart? People say in confessional poetry that you use too many raw emotions, but I think there is a great deal of craft that goes into dealing with those emotions. There is as much craft in what you haven’t said in the poem, as to what you have said. I also think the silence is interesting. We might have to come up with a new term in poetry for this, as opposed to confessional. You once did a reading at Holloway prison, what did you learn from that experience? I loved it. I got a huge amount of support from the women prisoners. They were all shouting and they got really involved and just kept asking me lots of questions about my work. They were so much more active than a normal audience. You go there and open your heart and they open theirs. You are reading to people whose lives have been out of control, and they are trying to regain control when they are in prison. So the readings took me to a very deep place. What you learn isn’t just about a class difference, it’s about: what led these people to this point in their life?